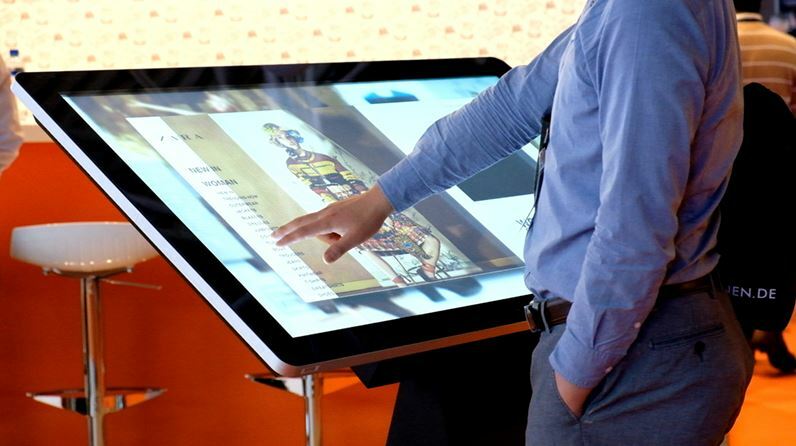 These all-in-one interactive displays combine the best in PCAP Touch Screen technology with a stylish and secure floor-standing kiosk. The screen resembles a giant tablet with an edge to edge glass tempered front with aluminium bezel and no branding or buttons. Perfectly suited for use in commercial applications, with an easy to use ergonomic design that allows users to comfortably interact with the screen. The striking design, along with the built in dual OS PC plus support for third-party devices, set this solution apart from other touch screens on the market both in terms of functionality and aesthetics. The front tempered glass face is designed for the rigours of public use. It is also plasma treated to give it an oleophobic coating. This makes it more resistant to surface oils and moisture which helps reduce the residue left by fingerprints. It also helps to lower the surface tension and friction, making touch gestures smoother, improving the overall tactile experience for the user. All this is achieved without an etched finish which means that the overall optical clarity and brightness of the screen is maintained. 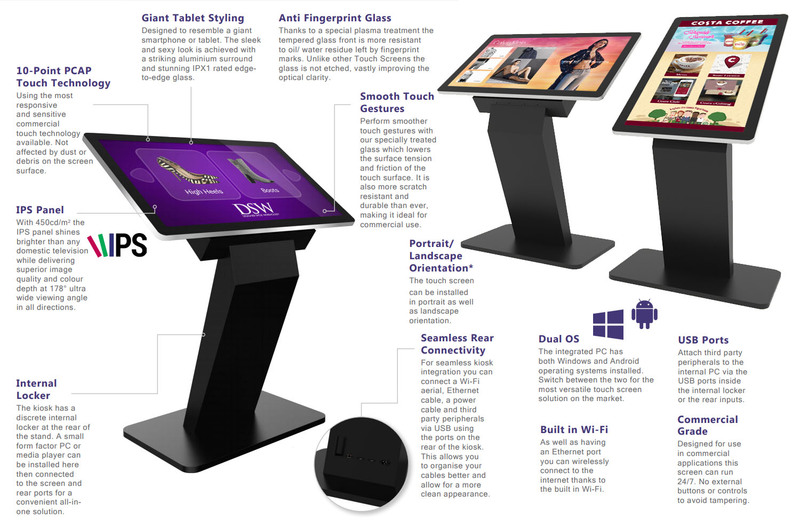 These Touch kiosks are an all-in-one solution with an integrated PC for both Windows and Android operating systems. Only Android is supplied as standard but a Windows licence can be purchased with the screen. However if you wish to connect an external PC or media player there is a secure and discrete internal locker on the rear of the display that allows you to integrate such devices seamlessly. Simply connect your device to the screen via VGA or HDMI (for the video signal) and USB (for the touch functionality). The screen will then serve as your computer’s interactive monitor. You can also extend the connections on your device, such as the USB ports, LAN port, Wi-Fi aerial and power cable to the external ports on the rear of the kiosk. Built with a commercial grade LCD panel and components these displays are designed to run 24/7 in constant use; unlike domestic tablets. The panel also has a lifespan of over 70,000 hours of continuous use. The 43″ and 50″ models can also be used in portrait orientation. Combine these screens with our new Touch Screen Content Management System that puts you in control as you create and deploy your very own interactive content. First, you create your custom layouts with our user friendly software that requires no knowledge of coding to use. Then deploy the content from your PC direct to your Touch Screens in a matter of seconds. Then you can let the content do the talking for your brand, company, service or product. Annual subscription charges apply for the CMS solution. Pricing starts from £2,295 +VAT (inc. delivery) for the 43″ model. Call us on 01462 433558 for more details.